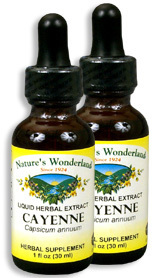 Cayenne Extract, 1 fl oz / 30 ml each (Nature's Wonderland) - Penn Herb Co. Ltd.
Spice up your wellness program with Cayenne! The fiery fruit revitalizes energy, increases digestive comfort, and invigorates circulatory health. The aromatic spice fires up your internal furnace too! 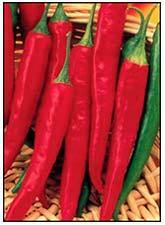 Cayenne stimulates the body to burn extra calories and speeds up metabolism of fats and carbohydrates. Simply add a few drops of the warming spice to water, tomato juice or other vegetable juice. ALSO KNOWN AS: African Bird Pepper, Capsicum, Capsicum frutescens, Cayenne. AMOUNT PER SERVING (100 mg/ml or 15 drops): Certified Organic Cayenne Pepper (Capsicum annum). OTHER INGREDIENTS: Grain Alcohol (75-85% by volume), Deionized Water. Free of: milk, dairy, egg, fish, shellfish, tree nuts, peanuts, wheat, gluten or soy. Stimulating circulatory tonic; support cardiovascular and arterial health; promotes healthy digestion (stimulates production of gastric juices & encourages the secretion of beneficial digestive enzymes; alleviates gas, upset stomach and nausea). Gastrointestinal support; promotes bronchial and respiratory health; supports throat health (gargle); cholesterol & blood pressure wellness. HERBALIST HINT: Add Cayenne to any herbal combination to boost the therapeutic benefits. 3-15 drops in water or juice, 2-3 times daily or as needed. Shake well before using.